All works were realised during one week in Nikshich, Montenegro, as a part of art residence from Ducley Art Foundation (based in Kotor, Montenegro), and with support from Hip-Hop Accademy (Moscow). Works were then presented in the Foundtion as a photo project . 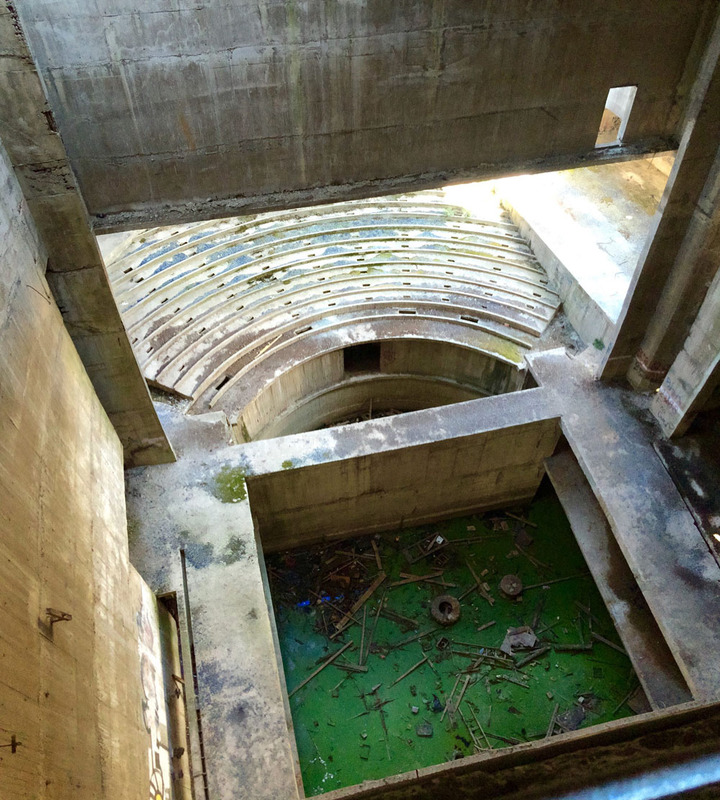 "Based in abandoned and half ruined monumental building of the Home of Revolution in Niksic, Montenegro, the Project uses the walls of the brutal monument to the totalitarian era as an object of inspiration for the world famous art activists alone with the younger generation of street artists to start a philosophic public art research on the issue of Revolution [as a tool for Evolution]. Dom Revolucije Project is aimed to bring Montenegro to the Art World map by developing both local and global street culture primarily by the means of street art and all of it’s various forms with focus on Balkans region historical heritage and cultural context. The project is curated by Michael Oger, CEO and founder of Hip-Hop Academy Moscow. Curator and the first two street artists - Petro Aesthetics and Misha Most were invited by Dukley European Art Community as part of its residence program. With the support of Niksic city administration and local NGO BIT within one week of intense work the first mural was created by Petro Aesthetics on the rooftop of the building. The artist got his inspiration from the architectural forms and brutal history and drew a giant abstract red star with his name encrypted in it. The size of the masterpiece is over 200 square meters, which officially makes it the biggest mural in Montenegro. Besides the mural Petro created two abstract pieces on the ground floor of the building. The second artist in the project was Misha Most. Under the heavy impression of the brutal architecture and decaying endless interiors of Dom Revolucije he created a street art gallery of his works on the ground floor of the building. The works can be described both as pictures from the wars in the past or as some captures from the antiutopic future. One of the works though stands along - the hand full of pieces of blue broken glass. Same as the floor of Dom Revolucije is all covered with the pieces of blue broken glass falling from its broken roof and windows. The name of this piece is "Value what you have". As a conclusion of the work accomplished by the team during their residency in Dukley European Art Community and aiming to bring more awareness to the project a special space dedicated to the project was created in Dukley Art Center Kotor. At the moment there is an exposition of photos capturing all the created street art, showing some architecture details and atmosphere of the place. This room in Kotor is like window to Niksic, so that people who never leave the coast have their chance to feel the taste and energy of the biggest Montenegrin northern town and see how street artists are challenging the decaying concrete jungle. The room number is 117, it’s opened every Sunday, same as all of the art studios in DAC/Kotor. Hopefully this Fall the Project gets officially supported and institutionalized by local authorities and more street artists and curators will be invited to catch their inspiration and create more revolutionary street art. The space on this canvas is not going to end in near future for sure." Artist in residence. Bazel, Switzerland. "Big cities are the spiritual home of graffiti art. Moscow has MISCHA MOST, one of the most imaginative graffiti artists of the post-soviet era. Today, his artistic talent is well known throughout Western Europe, and not just on the streets. His artwork has gone from building walls to the leading galleries for modern art. Most is not afraid to tackle sensitive issues and is a master of social criticism. He paints messages in large letters and brings city landscapes to life with subtle lines. His art is explicitly defined by <No Future Forever>, a motto intrinsically tied to the British punk scene of the 1980s. Many of his works are based on the defeatist paradigm <consume, work, die>, while Most attempts to explore the ever more complex situations in today‘s capitalist-driven world. Press: Oslo 10 exhibition space at Dreispitz, Bazel Switzerland. - 3 "cameras" installed in Basel city parks illegaly. "Art-Veretievo" Festival of contemp. art. Veretivo Mansion.